Although Charlie Kaufman didn’t direct this movie, he wrote the screenplay, and his influence is all over this film. Being John Malkovich, Adaptation, Confessions of a Dangerous Mind, Eternal Sunshine, Synecdoche New York, Anomalisa; Kaufman may be the most well-known writer in the industry, his films simply stand out among the crowd, no matter who the director. He crafts extremely weird worlds and expects us to work to try to understand them, and those of us who love his work are only too willing. We might not understand every thought going through his head and making its way on to paper, but his intentions are clear; he wants to mess with our minds and, at the same time, reveal truths to us that we can only see when we’re confused. It makes some sort of sense the more you experience his movies, or perhaps the crazier you let him drive you. Joel and Clementine are two lost souls who find each other on a Montauk beach in winter and who have an instant connection, despite their own crippling personality problems. Joel is timid, unmotivated, and sad, while Clementine is emotional, compulsive, and confused. But they seem to fit well together, at least for a time, and they are happy, at least at first. But their relationship begins to break down, as some do, and soon they may go their separate ways. Joel doesn’t know it, but Clementine has taken the drastic measure of hiring a company to eliminate Joel from her memory, the thought of their past love now too painful to bear. Now she doesn’t know him from Adam, so Joel vindictively takes the same measure and hires the same company. But during the process, his mind rejects the idea of taking Clementine away forever, and so he hides with her inside his own brain, running from those who would take her away, and trying to remember the love that was once all they knew. 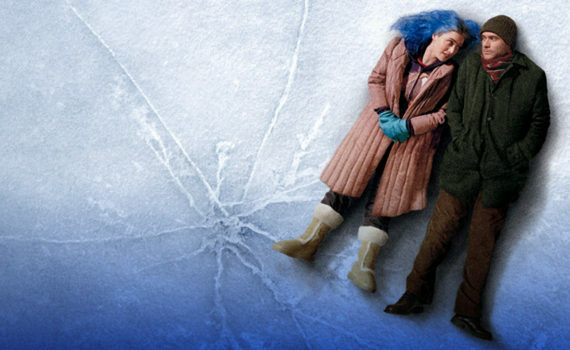 For an extremely odd romantic comedy that’s also part science fiction, Eternal Sunshine received a ton of credit and praise when it was released early in 2004. Not only Kaufman for writing a wonderfully original screenplay, but Winslet as well, for one of her strongest performances, and even Carrey, for a solid step away from comedy. It’s #88 on IMDb’s Top Rated Movies list, and I remember being very impressed by it when I was 20, much more than I was this time around, now that I’m 35. I still appreciate what the film is trying to say, and the funny moments balance out the dark ones quite nicely, but I guess I’m less impressionable now than I was, and so the impact that was already made 15 years ago wasn’t able to leave its footprint this time around. I simply didn’t find the message as deep as I did years ago, when I was still curious as to what love was, not married with two kids. A great film no matter when you watch it, but one that perhaps views better when you’re young, Eternal Sunshine has a lot to say no matter what, and deserves its well-earned spot near the top.